The horse series has long been a showcase of evolution. But in reality, this series is the best argument that can be presented against evolution from the fossil record.1 Creationists have various opinions on whether the horse series is in fact made up of different created kinds. This article addresses some of the current problems, and concludes that the horse series probably comprise three different created kinds, not including all animals that have been labeled Hyracotherium. Hyracotherium itself appears to contain several different created kinds such as animals similar to tapirs. Horse fossils have been found in sedimentary strata at the beginning of the Tertiary period during a time-span called the Eocene (approximately 50 million years ago, according to uniformitarian dating). They are usually labeled2 Eohippus or Hyracotherium (see figure 1). According to the theory of evolution, it is possible to follow horse evolution through millions of years: how the horse slowly became larger and stronger (figure 1), lost many of its toes (figure 2), and how its tooth-structure changed when it moved from a diet of broad-leaved plants, shrubs and trees (browsing) to eating hard, dry grass (grazing) (figure 3).3,4 Horse evolution is believed to have been driven by a cooling and drying climate. Early horses supposedly lived in humid forests full of plants rich in foliage. Their toes, four at the front and three at the rear, sprawled out at different angles which helped them from sinking in the marshy ground. As the climate became drier, foliage plants disappeared and huge grass fields formed. This forced grazers to become better runners to be able to escape their predators. All horses resemble each other so much that they have been classified in the same family—Equidae. Because of this close similarity it can therefore often be difficult to discern any differences through the study of fossil skeletons alone. Another caution in identifying vertebrate fossils is that the variation in structures even within a genus of living animals can often be so great that it overlaps with the variation in other groups; e.g. there is much analogy in the tooth structure between different carnivores, even when the animals are not classified in the same genus (or sometimes not even the same family). The most important diagnostic differences between different groups of animals are often in the construction of the soft parts. Many findings of fossil horses furthermore only consist of teeth or parts of jaws. The most important diagnostic differences between different groups of animals are often in the construction of the soft parts. In the horse series, it is possible to discern certain animals that could represent created kinds, even though we only have access to fossil skeletons. The following facts seem to support such an interpretation. The early Parahippus species are supposed to resemble Miohippus and Mesohippus while the latter ones are supposed to look like Merychippus; this is only partly supported by the fossil findings.11 Furthermore, the fossil material for Parahippus is incomplete.12 It would probably be possible to classify the different parts of Parahippus as belonging to two different animals—Miohippus (figure 4) and Merychippus.13 This latter result can also be inferred by the work of Cavanaugh et al.,14 as Parahippus showed similarities to 14 of 18 species of horses. Therefore, the “Parahippus” step in the horse series appears to be a mixed up group of unrelated fossils. In 1992, the genus Hyracotherium was reclassified as five animals belonging to different families of which only one group was regarded as having anything to do with horses.15 More recent research has reclassified these animals into ten different genera and at least three families, of which many are not supposed to have anything to do with the horse series but are similar to e.g. tapirs (family Tapiromorpha).9 One Hyracotherium species (angustidens) has been renamed Eohippus, and all the other Hyracotherium species except one, have been given new genus names. The single animal still retaining the name Hyracotherium (leporinum) is no longer in the horse series but is regarded as belonging next to the Palaeotheriidae, which resemble tapirs and rhinoceros. 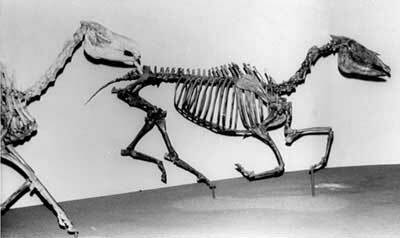 Hyracotherium/Eohippus and Orohippus do for instance appear in the fossil record at the same time as Epihippus. Mesohippus and Miohippus appear together with Merychippus and Parahippus. Almost all other horses (with a possible exception of one or two)—Parahippus, Merychippus, Pliohippus, Equus and possibly also Miohippus—are represented at the same time during much of the period when they have been found as fossils.16 (But especially in the newer evolutionary schemes, different names have been given to very similar animals, giving the appearence of evolution as well as providing fame to their discoverers; see examples in Froehlich 20029 and MacFadden 20054). Fossils of Hyracotherium (sic) have also been found very high up in the strata (Pliocene), but these findings have been rejected as reworked (i.e. eroded and deposited at a later strata) in spite of the fact that the geological observations do not show any signs of disturbance.17 Thus, the fact that most of the horses lived almost at the same time undermines their proposed evolution. Teeth on browsing (leaf eating) horses have closed, very narrow roots with small holes for their blood supply and nerves; i.e. these are teeth that wear down as the animal gets older. Teeth on grazing (grass eating) horses have an open root with many blood vessels which supply the teeth with lots of nutrients so they can keep growing during the entire life of the animal; this is termed hypsodonty, meaning high-crowned teeth. This change of tooth structure from bunodont (low-crowned with rounded cusps) to hypsodont (high-crowned) is not just supposed “microevolution”, but a complete change in design, even though it may not seem to be much of a new thing for those not acquainted with tooth construction.18 There is no evidence for any change of one tooth structure to another, even though it has been suggested by some authors.19 Some animals ate both grass and foliage,3,4 but this does not help to explain the transformation of one kind of teeth to the other. Eohippus (and many fossils that were formerly labeled Hyracotherium, but are classified into the family Equidae with new genus names9), Orohippus and Epihippus. Mesohippus, Miohippus, certain Parahippus and probably most of the horses branching out from these three groups. (The horse series has been rearranged and many new genera have been added; e.g. Neohipparion, Nannippus and the Hipparion clades have been moved close to Parahippus and away from Merychippus,4 in contrast to figure 1, so we can not be sure if the classification/grouping of all the fossils is correct. But the horses branching out from Merychippus in figure 1 are still classified in the subfamily Equinae, and are therefore combined in group three, below. But all these details cannot be dealt with in this article). Figure 4. Two ‘horses’, Neohipparion (right) and Miohippus (left) from the Museum of Natural History in Los Angeles. The animals in group 3 are all classified in the same subfamily—Equinae.20 Although, Cavanaugh et al.10 discovered that the fossil animals could be sorted into subfamilies, they disregarded this finding and instead constructed their own horse evolution tree. It would not be difficult to create a similar tree by simply arranging any number of unrelated living animals in a series from small to large (figure 5). Figure 5. From left to right, Eland, Gnu, Bushbuck, Gazelle and Dik-dik. Even animals alive today can be arranged into a hypothetical evolutionary series, since variations in the skeleton within one group of animals often overlap with the variation in other groups within the same family. 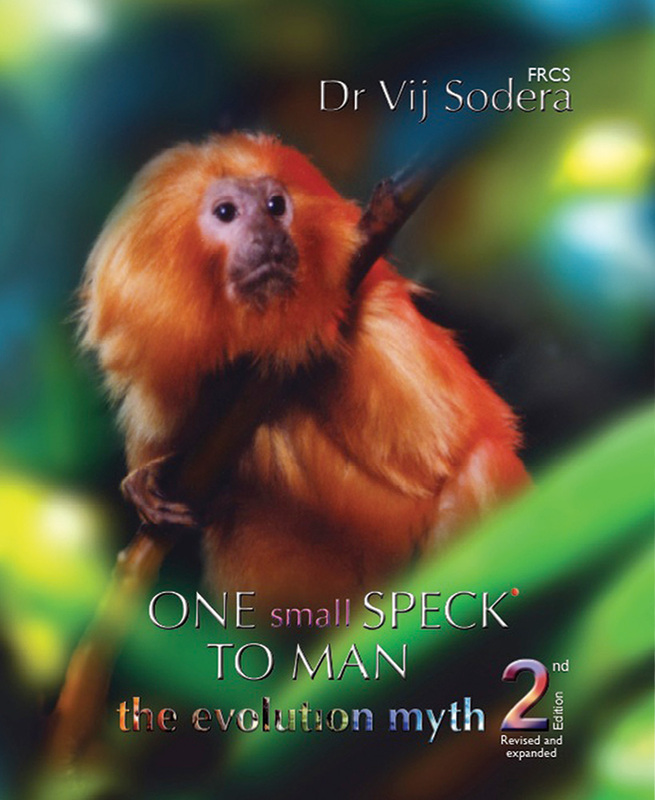 This does not prove, however, that any individual animal has evolved into another. Froehlich,9 who completely renamed most Hyracotherium species and placed them in different genera and families, used statistics, but also provided criticism to the way statistics can be misused in this case. But, at any rate, one cannot use statistics on design or on a limited amount of data (which in these cases are mostly teeth and jaws) to find out how evolution supposedly occurred, as the above authors have done.9,14 Statistical analysis in this case does not take into consideration function or completed/designed living entities, but can only compare small differences (see also more critical points in Froehlich9). In this case, most of the statistical analysis has been carried out on the small differences in tooth enamel/structure and jaws, and very little work has been done on other parts of the body. This does skew the interpretation of the data in a similar way as if, for example, we would conduct statistics on 75 differences on the outside appearance of the eyes of octopuses and humans—the analysis would probably show that we evolved from octopuses. A study of fossil horses reveals at least three groups of animals within the horse family Equidae, in addition to some unrelated animals such as tapirs. Although it is easy to discuss and criticize single finds, or a single place where fossils have been found, according to all the available data there appears to be three groups of animals that closely correspond to the subfamily groups of Equidae, and only the subfamily Equinae appears to represent horses. The discussion about post-Flood and Flood criteria, based on horse evolution by e.g. Cavanaugh et al. 200314 and Wood 200821, must therefore rest upon criteria other than the purported post-Flood “microevolution” of the horse resulting from a changing environment, as proposed by the common evolutionary story (see other criteria for Flood boundaries in Oard 200724). There were also no real environments where these animals could have lived, only large deserts—most fossils are found in sedimentary deposits which show evidence of being from the Flood, but there is no evidence of a plant cover which could feed large herds of animals, and no proper soil.25 There is also no support for changes in environment, as evolutionists and Cavanaugh et al.14 and Wood21 insist on based on speculative interpretations. In the case of the horse, it could be body size that governed how quickly the animals sank, were transported and buried, and then sometimes eroded and redeposited, during the Flood or in the close aftermath of the Flood. This would have been before the continental environment had become habitable again and living animals repopulated it. Small animals with similar construction commonly disintegrate and sink quicker than large animals, and smaller bones are also more easily transported by currents after having reached the bottom. Also, during post-Flood catastrophes, living animals could have been buried together with reworked, dead, unfossilized or partially fossilized animal remains buried during the Flood. A study of fossil horses reveals at least three groups of animals within the horse family Equidae, in addition to some unrelated animals such as tapirs. The three equid groups correspond closely to different subfamilies of Equidae, and could be considered three separate created kinds. Most of these different kinds lived (or actually, were buried!) nearly at the same time and do not show much progressive change as far as horse evolution is concerned, just a general increase in size. No one has explained how new, specialized kinds of teeth could have supposedly evolved, and it appears rather to be a case of intelligent design instead of “microevolution” (variation within a kind, as suggested by various creationists) or “macroevolution” (new kinds of organisms, as suggested by evolutionists). The Cavanaugh et al. (2003)14 hypothesis of intrabaraminic variation of all animals that belong to Equidae (or animals that they did put into Equidae, even if the evolutionists put some of them in different families) is not well supported by the available evidence and ought therefore to be abandoned. This article is partly based on an English translation (by Rudi Arbella) of Molén, M., Vårt ursprung? (Our Origin), XP-media, Haninge, 2000. Return to text. The name Hyracotherium is no longer in use for any member of the family Equidae, but the fossils of this genus which are still classified in Equidae have been given seven new genus names: Sifrhippus, Minippus, Arenahippus, Xenicohippus, Eohippus, Plilolophus and Protorohippus. Return to text. Some horses with teeth designed to eat grass probably mostly ate leaves and other soft plant parts. See: Morell, V., Dietary data straight from the horses mouth, Science 283:773, 1999; and MacFadden, B.J. 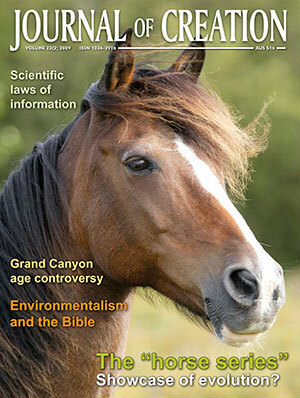 et al., Ancient Diets, Ecology, and Extinction of 5-Million-Year-Old Horses from Florida, Science 283:824–827, 1999. Return to text. MacFadden, B.J., Fossil horses—evidence for evolution, Science 307:824–827, 2005. Return to text. Simpson, G.G., Horses, Oxford University Press, New York 1951. Return to text. The picture is based on drawings from: Steinmann, G. and Döderlein, L., Elemente der Paläontologie (Elements of Paleontology), Wilhelm Eng-elmann Publishing, Leipzig, 1890; Osborn, ref. 11; and Scott, ref. 12. Return to text. The picture is based on drawings from: Steinmann and Döderlein, ref. 6; Osborn, ref. 11; Mutvei, H. and Stuenes, S., Paleontologi: Kompendium för grundkurs i paleontologi (Paleontology: Compendium for Basics in Paleontology), Uppsala University, Institute of Paleontology, Uppsala, 1983; and Granger, W., A revision of American Eocene horses, Bulletin of the American Museum of Natural History 24:221–264, 1908. Return to text. MacFadden, B.J., Cladistic analysis of primitive equids, with notes on other perissodactyls, Systematic Zoology 25:1–14, March 1976; and Simpson, G.G., Horses, Oxford University Press, New York, 122–123, 203, 1951. Return to text. Froehlich, D.J., Quo vadis eohippus? The systematics and taxonomy of the early Eocene equids (Perissodactyla), Zoological Journal of the Linnean Society 134:141–256, February 2002. Return to text. Abel, O., Paläobiologie und Stammesgeschichte (Paleobiology and the History of Phylogeny), Gustav Fisher Publishing, Jena, pp. 284–290, 1929; and MacFadden, B.J. et al., Sr-isotopic, paleomagnetic, and biostratigraphic calibration of horse evolution: evidence from the Miocene of Florida, Geology 19:242–245, 1991. Return to text. Osborn, H.F., Equidae of the Oligocene, Miocene, and Pliocene of North America: iconographic type revision, Memoirs of the American Museum of Natural History 2:74–75, 1918. One example is that one of the most “primitive horses”—Para-hippus cognatus—supposedly evolved as one of the last species, while one of the least primitive—P. coloradensis—evolved at the same time as the first species of Parahippus. Return to text. Scott, W.B., A History of Land Mammals in the Western Hemisphere, 2nd ed., Macmillan Publ. Co., NY, p. 409, 1937. Return to text. In the Parahippus group there are some findings that are assumed by some researchers to be intermediate forms between Parahippus and Merychippus (e.g. with reference to pictures in Osborn, ref. 11, where some of the least “evolved” “horses” originated amongst the last ‘horses’; see pp. 74–75). These findings only consist of teeth and parts of jaws that can be difficult to tie to a certain skeleton. Hence, these teeth and jaws could therefore be sorted into Parahippus and Merychippus, rather than any intermediate form between these two animals. Return to text. Cavanaugh, D.P., Wood, T. and Wise, K.P., Fossil equidae: a monobaraminic, stratomorphic series; in: Walsh, R.E. (Ed. ), Proceedings of the Fifth International Conference on Creationism, Creation Science Fellowship, Pittsburgh, PA, p. 143–149, 2003. Return to text. MacFadden, B.J., Fossil Horses, Cambridge University Press, Cambridge, pp. 92–103, 1992. See also Scheven, J., Mega-Sukzessionen und Klimax im Tertiär: Katastrophen zwischen Sintflut und Eiszeit (Megasuccessions and Climax in the Tertiary: Catastrophes Between the Flood and the Ice Age. ), Wort und Wissen, Neuhausen, 1988. Return to text. Scott, ref. 12, p. 408 and Osborn, ref. 11, p. 74; Barnhart, W.R. A Critical Evaluation of the Phylogeny of the Horse, ICR, 1987; MacFadden, ref. 15, pp. 255–257; Storer, J.E. and Bryant, H.N., Biostratigraphy of the Cypress Hills Formation (Eocene to Miocene), Saskatchewan, Journal of Paleontology 67:660–669, 1993; Gould, S.J. and Eldredge, N., Punctuated equilibrium comes of age, Nature 366:223–227, 1993; and Scheven, ref. 15. Return to text. Barnhart, ref. 16, pp. 140–143. Return to text. Personal communication with Dr Jack Cuozzo. Return to text. Sarfati, J., The non-evolution of the horse, Creation 21(3):28–31, 1999. Return to text. Gromova, V.I., Mammals in: Fundamentals of Paleontology: A Manual for Paleontologists and Geologists of the USSR, vol. 13, Orlov, Y.A. (Ed. ), Jerusalem, English translation, Israel Program for Scientific Translations, p. 396, 1968. Return to text. Wood, T., Horse fossils and the nature of science, 2008; answersingenesis.org/articles/am/v3/n4/horse-fossils. Return to text. MacFadden, ref. 15, pp. 92–103. Return to text. Whitmore, J.H. and Wise, K.P., Rapid and early post-Flood mammalian diversification evidenced in the Green River Formation; in: Walsh, R.E. (Ed. ), Proceedings of the Sixth International Conference on Creationism, Creation Science Fellowship, Pittsburgh, PA, pp. 449–457, 2008. Return to text. Molén, M., Mountain building and continental drift; in: Walsh, R.E. (Ed. ), Proceedings of the Third International Conference on Creationism, Creation Science Fellowship, Pittsburgh, PA, pp. 353–367, 1994. Return to text. Huxley, J., Evolution in Action, Chatto and Windus, London, pp. 47–48, 1953. Return to text.